Unusual things attracted people at all times. And if you take amazing forms of living trees, then by such beauty no one will pass untouched. 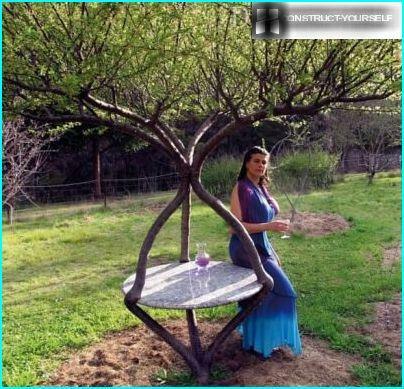 One of the jewelry trends in landscape art may be called tree shaping - growing trees in the form of chairs, geometric shapes, florid ornamentation and even humans. But not to be confused with the tree shaping topiary and bonsai. These are three different techniques, and what is the difference between them - will understand specific examples. In addition, the simplest form of tree shaping can create any cottager who has enough endurance and patience for molding, immunizations and care for their sculpted trees. What kind of trees are suitable for tree shaping? Tree shaping - not a new trend. It was invented in the second half of the 19th century in America. But until that time, trees grown in the technique of tree shaping, rarely encountered in Europe, and only in the former Soviet Union, and all are considered exotic. So if you want to surprise your friends and acquaintances, try to create with this technique at least one tree. 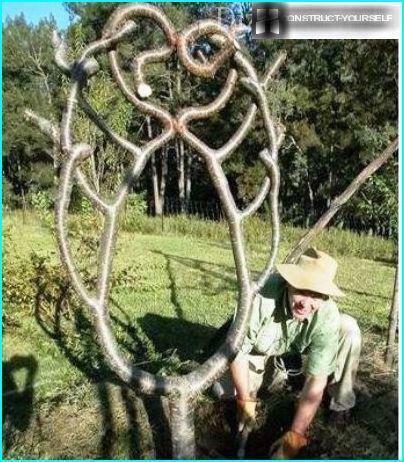 The essence of the tree shaping to processcultivation of plants give it a fancy shape with the help of stem curvature, forming branches and, if necessary vaccinations. At first glance, it looks like a bonsai technique, which also are twisted trunks. But Bonsai - the art of growing miniature trees with full features large. A specially bent plant, giving it unnatural shape arbotehnike. Different shapes can be given crops and usingtopiary art. But in this case the original forms and figures are obtained thanks to the constant mowing leaves and thin twigs. And the leaves do not touch the tree shaping. The task of gardener - to transform the shape of the trunk to bend the skeleton until he could not odrevesnet. And you can not experiment with a single seedling, and combined into one ensemble on 3.4 and more trees. Their trunks joined by grafting, and even the trees themselves heal wounds increment tightly to each other and forming the junction of the scars, growths. To the tree endure all the troubles,which will expose his master, it initially has to be adapted to the climate of the area. So what of the ordinary birch, ash, maple and wild cherry is easiest to create a sculptural masterpieces. Fruit is also a good idea transfer molding, but yields will give a little bit later than usual time: 4-5 years (apple) and a 7 year. Starting to learn a new technique or better with willowplum. Both are growing rapidly, good take root and do not require special care. If you buy a tree in a nursery, then immediately have to learn from what brought the edges. It is better that it be grown in domestic land. A full list of trees that can be easilycurvature can be found in encyclopedias bonsai, as this technique is much more popular and therefore more is broadcast on the Internet. 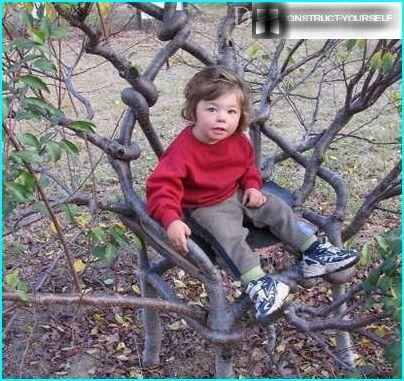 However, pay attention to what is needed for tree shaping trees, while the bonsai and subjected to low-growing shrubs. Buy a sapling with a flexible stem. (Check with the purchase, slightly moving the trunk in hand if the barrel had odrevesnet -. Look more youthful sapling). 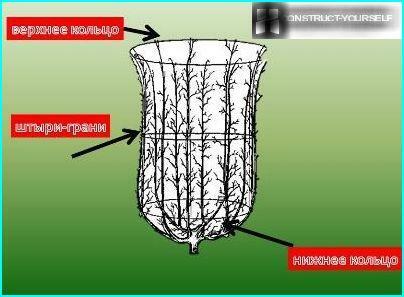 Put the plant is not vertical, and at a certain angle (30 degrees), so that it takes root have a bend. Try to tilt the top of trees, and see the place where it is most amenable to bending. Most often, this place is at the top, the youngest of the barrel. All branches below the fold point cut in the ring (right next to the trunk, without stumps). Of the two poles bring down cruciate support so that it was above the seedlings of 10-20 cm, and the place of intersection of the sticks falls on 1/3 of the top support. Dug in the ground support so that the barrel was approximately in the middle between the sticks. 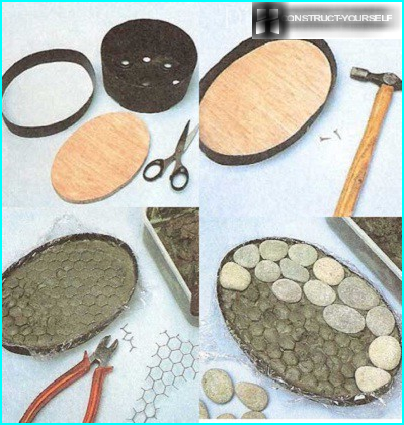 Tie stick to one seedling at a pointfold plants and half the remainder. Balance the top bend in the opposite direction and attach to the second stick, which is at an angle to the first. If the plant is too small, its bend only in one place, and wait for a couple of months, while it grows in such a state to be able to repeat bending. Cranking trunks can be only in the spring and summer, when the sap flow has gone into the tree. Up to this point the seedling has no flexibility and can crack when tilted. All skeletal branches, located above the first placebarrel fold, it is necessary to also form. To do this, the tree leaves are the strongest branches and give them a tilt angle, hanging weights on the ends. If you need a strictly horizontal line, or exactly a given direction, nailed to the main horizontal support rails at the points where a branch extends from the trunk, and tie him to the middle and edge of the branches. When you see that the trunk and branches are hardened, solid steel, can shoot a supportive framework. trunk bends can be created in such a way as you like, changing to higher support. For fruit trees fit into the landscape,can improve their shape, creating a vase out of the trunk, flower, cup, spiral and so on. As such, they are decorative in any season. Make a sculptural masterpiece is not difficult, but it is necessary to form a crown for several seasons. First of all, think over what form willtree. We recommend to start with a vase. 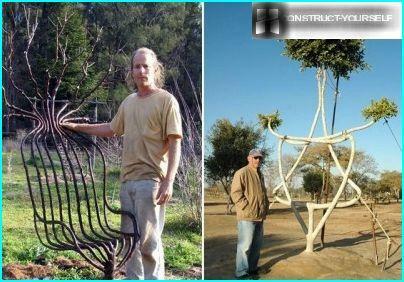 To this end, welded metal frame in the shape of a vase, height and width of 2 meters and set it in the place where the sapling will grow. The frame is a ring-meter-diameter bottom, which go up the curved metal pins (6-10 pieces), to mimic the shape of a vase. Above all pins are welded together by means of another metal ring with a diameter of 2 meters. Install necessary thoroughly to frame not looked or donkey over time. In the center of the lower ring frame planted sapling. This should be done in the fall to the spring rooted plant. Seedling should be annual and grafted on dwarf rootstock. In early spring, cut the entire top of the seedlings, leaving only 30 cm barrel. Devoid of the center conductor, i.e.the top of a tree will increase lateral shoots. Of these, only the upper left, the number of which shall be equal to half the number of pins of metal frame. If you have a bowl of 10 faces, leave 5 branches, unless the 6 - 3. They are given the freedom to grow. The remaining branches are cut at the ring. All of the following summer watching the growth of the majorapical shoots. 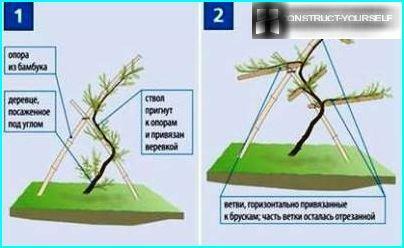 Branch to have the same thickness, it is possible to regulate the power of tilting in different directions. If escape frail - straighten it as much as possible vertically and fixed to the frame. If too thick stands out from the rest - Bend horizontally to suspend the movement of juice. Devoid of the center conductor, i.e.the top of a tree will increase lateral shoots. Of these, only the upper left, the number of which shall be equal to half the number of pins of metal frame. If you have a bowl of 10 faces, leave 5 branches, unless the 6 - 3. They are given the freedom to grow. The remaining branches are cut at the ring. During the year, the apical skeletal branches become stronger, so in the spring spend their deep pruning, leaving only a small part with two kidneys. The rest - is removed. Of the two kidneys grow new shoots, whichfaces become bowl. Each escape with increasing fixed to the frame pins to give it a strictly vertical position. 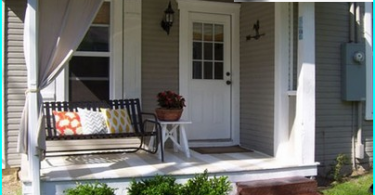 Do you still follow the development of wood trim on the major skeletal branches of side shoots. Leave on every tree "brink" of 3-4 escape, cutting off their tops to the level from the beginning of the second sheet. They begin to form fruit buds, and eventually your vase is covered with juicy fruit. 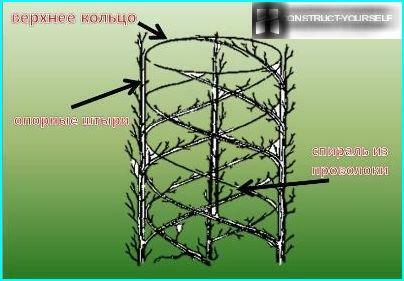 When the main branches reach high pointssupporting frame and odrevesneyut, you can remove the metal structure. From now on, the tree itself will keep the desired shape, and only you will thin out excess shoots and restrain the growth tops to avoid losing a sculptural effect. Cooking frame. It is necessary to weld the metal frame in the shape of a cylinder. 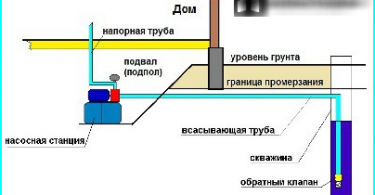 The cylinder consists of identical top and bottom rings (up to 2 meters in diameter), and four pins therebetween. The pins must be welded at the same distance from each other. Further pins wrapped around a thick wire, starting from the bottom and its winding coil on the frame at an angle of 40-45 degrees. The distance between the spiral rings - 35-40 cm. Planting trees and swifts. Then planted 4 trees on the annual outdoorside structure at the points where the frame supporting pins go up. Trunks are fixed to the pins so that they developed strictly vertical. Skeletal branches leave only those that are at a level extending helix and bind them to the wire. The rest is removed in the ring. On the trunk of a 2-meter-high, you should have about 5 branches. In what direction to guide them - look for the compliance of escape. Where he bends easier to get and record. Gradually branches coiled wire helix and odrevesneyut 2-3 years. The waste from these branches remove shoots that they do not weaken the growth of the main branches. When all the branches of a spiral closes, and they will become thick, the wire is removed and disassembled frame. The resulting wood spiral will surely stand out in the landscape, causing the envy of others. As you have read the instructions to become a sculptor in his own garden is quite simple: you only have a desire and a good welder at hand, which will make reference frames.